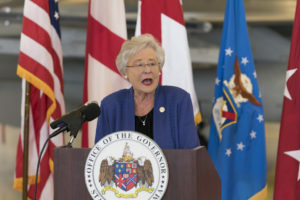 Mobile, Ala. — After hyperventilating through last December’s special-election version of a house of horrors, Alabama voters shrugged their collective shoulders this spring at allegations from disparate sources that Kay Ivey, the incumbent governor, is a lesbian prone to slurred speech who attends too many cocktail parties. She didn’t, however, take the lead on much of anything during her 14 months in office. Sure, she could claim Alabama’s lowest unemployment rate ever — almost exactly tracking the national numbers — but without specifying anything she had done to achieve that success. And when a reactionary state school board engineered the ouster of the reformist state school superintendent after he had spent less than a year on the job, Ms. Ivey, the board’s president (ex officio), avoided the meetings. Alabama voters seemed not to hold Ms. Ivey’s disappearing acts against her. Until the campaign’s final weekend, at least, they seemed just to want to avert their eyes from politics altogether. “Republican voters in particular are getting kind of fed up with the whole process,” said Candace Cooksey, a Republican consultant in Alabama with no client in the governor’s race but a dozen other clients this cycle. Voters had reason to be fed up…. In the fall, Ms. Ivey will face Walt Maddox, the four-term Democratic mayor of Tuscaloosa, who gained praise for both crisis management and longer-term policy innovation in response to a horrible tornado in 2011. He cultivated a “business-friendly” image, thus reassuring moderates, while attacking his opponent, Sue Bell Cobb, a former state chief justice, from the left for her support of Mr. Sessions for attorney general. Mr. Maddox won big in the Democratic primary. In the general election, he will try to disprove the proposition that the only way a Democrat can win statewide in Alabama is if his opponent gets evicted from office twice and makes passes at teenagers….